The situation is escalating in Libya, where more than 30 people have been killed since fighting broke out on April 4, when forces loyal to Libyan strongman Khalifa Haftar launched an offensive against the internationally recognized government in Tripoli. Amid accusations of Russian support for Haftar, Kremlin spokesman Dmitry Peskov on April 8 urged all sides “to avoid any actions that could provoke bloodshed and the death of civilians.” But Moscow has not condemned Haftar’s military campaign. RFE/RL spoke with Tim Eaton, a research fellow with Chatham House’s Middle East and North Africa program, about Russia’s interests and actions in Libya. RFE/RL: What are Russia’s interests in Libya? Tim Eaton: Well, what I think we’ve seen from Russia is it hasn’t committed serious resources to Libya, but it’s sought to capitalize on opportunities where it’s found them. And I think sometimes Libya is viewed as a place where Russia can have some leverage, but without having to commit too much in order to exert that leverage. Prior to the revolution, Russia was a major arms supplier to the Qaddafi regime and it also had significant business interests in Libya. Following the revolution, it’s lost those and I think what we’ve witnessed in recent years is Russia looking on a number of levels — the security level, the diplomatic level — to see how it might return to the fore. And for that reason, it’s been talking to different sides, in different ways. RFE/RL: How does Russia view the current offensive on Tripoli by forces loyal to Libyan commander Khalifa Haftar? Eaton: Well, what I think we’ve seen from the Kremlin so far is that it’s been unwilling to publicly name Haftar and criticize the [self-styled] Libyan National Army (LNA) for its offensive. It seems to be remaining in its position of somewhat neutrality, although by not naming Haftar, or not criticizing him directly, it will be perceived as tacit support. I think for the most part though, Russia isn’t fully committed to a Haftar victory and does have connections with all sides of the political spectrum. In fact, different elements in the Russian system have been engaging with different elements of the Libyan system. So, I don’t think that it’s fully tied to the Haftar track, and it will be able to adapt to any developments we seen on the ground, particularly as it looks like Haftar’s offensive is slowing and may not be successful. RFE/RL: After Syria, is Russia looking to Libya to further expand its footprint in the region? Eaton: It has been speculated that Russia is looking for a footprint in the Mediterranean and that maybe Libya can be the site of that footprint. I haven’t personally seen evidence that that’s likely to be the case. I think what is more likely is that Russia will look to improve business ties, investment ties, with Libya and also look to build its influence in the political spectrum. That’s really what we’ve seen over recent years. 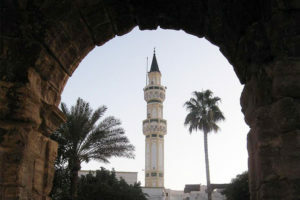 And actually where Russia has been most influential in Libya in recent years is the printing of banknotes and the minting of coinage, which has been delivered to the east of the country, which is not technically recognized as legitimate currency by the recognized central bank in the west of Libya, but has nonetheless been a significant form of support provided to authorities in the east and, by extension, the Libyan National Army, and Khalifa Haftar. RFE/RL: Russia has called on all sides to cease hostilities, but rejected a UN bid to condemn Haftar for his advance on Tripoli. Why? Eaton: I think it’s likely reflective of the fact that they’re continuing to talk to all sides and not be seen to be overly aligned with one camp. I think sometimes in the international coverage of Libya it’s presumed that Russia strongly supports Haftar, but actually it’s received a lot of delegations from Misrata in the west, from Tripoli, and has quite open ties with a lot of groups and individuals within the Libyan system. At the same time, if you look at the UN Security Council statement which came out, it’s also believed that the French were one of the driving forces behind not naming Haftar and not criticizing him. And, in fact, on Sunday [April 7], the U.S. did release a statement directly criticizing Haftar, but France has still not. It’s perceived that France is in the driver’s seat for this coverage of Haftar, if you like, through the statements and that it’s clear they’re not willing to criticize Haftar [like] the U.K. and U.S. are. And that has added to speculation about the amount of support that France is supplying Haftar behind closed doors. RFE/RL: What are Russia’s ties to Haftar’s forces? Is Russia providing troops, arms, training to them? Eaton: What’s widely speculated is that a large number of small arms and ammunition is provided by the former Soviet republics to Haftar’s forces. Of course, there was the very high-profile, visible visit of Khalifa Haftar to the Admiral Kuznetsov aircraft carrier [in January 2017]. That was seen as a major indication of strong ties between the Russian Ministry of Defense and Khalifa Haftar’s forces. At the same time, there has been speculation in the U.K. press in what looked like a leaked story about much more heavy weaponry being supplied to Khalifa Haftar and his forces in the east. I have yet to see evidence that that is the case. In fact, when you’re looking at the more sustained and the higher tech support for the LNA, it appears that that is coming from the United Arab Emirates, and indeed there have been UN reports providing evidence that that is the case.